At just 14 years old, she became a young carer and struggled with the sudden role reversal. Where her days had once been filled of catching up with school friends, they were now spent bathing her father and preparing his meals. As a teenager, she didn’t understand the disease nor why it was stealing her father away. When he eventually forgot who she was, Melissa began to doubt her own worth. “I wondered if I was not good enough to be remembered. A lot of questions ran through my head,” said Melissa, now 28. And so three years ago following the death of her father in late 2014, Melissa decided to start something that would help her caregiving peers who feel as lost and overwhelmed as she did. Project We Forgot offers a support system for young caregivers aged under 39. The online platform enables them to share their experiences and connect with others with the help of social media. Jason Foo, CEO of Alzheimer’s Disease Association commented; “Some of them [young caregivers] don’t even know what to do and they are so used to having their mum or dad taking care of them. The role reversal can be very difficult for the child to accept.” He estimates that every year, up to 200 young caregivers are “thrown” into the role because more people are getting dementia earlier in their lives. According to the National Neuroscience Institute in 2015, four times as many patients below 65 were diagnosed with dementia than in 2011. In Singapore alone an estimated 40,000 people live with dementia and one in 10 are under 65 years old. “If you think about it, this means the caregivers are also getting younger because the patients are getting younger,” said Mr Foo. Chan added: “This is where Project We Forgot comes in”. So far, the business has managed to build a community of 3,000 caregivers across social media channels. It has also engaged with more than 200 caregivers who have reached out to the social enterprise directly for help. By providing these tools and services to meet the needs of caregivers, the team hopes to figure out a sustainable business model as a social enterprise soon. 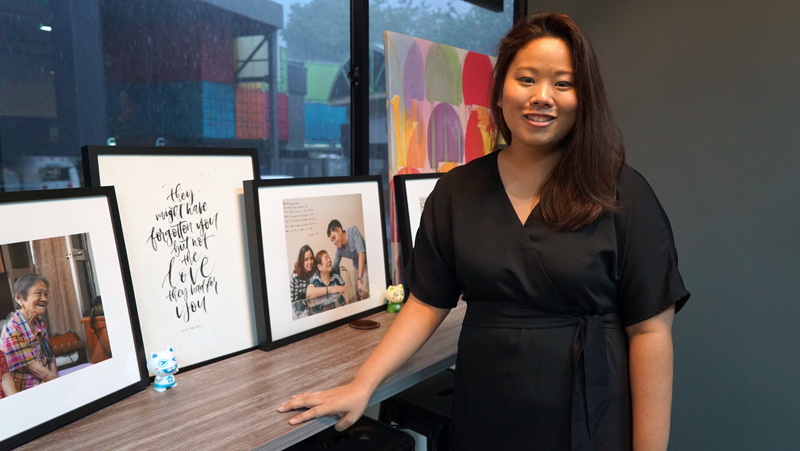 “One of the first few things people say to us is that we should be a non-profit or charity instead, but as a team, we want to see how we can shape the business model for social causes,” said Melissa. While Project We Forgot has not yet seen any profits, it has earned financial support from both the private and public sector — its only source of funding at the moment. Last year, it was awarded a $20,000 grant under the Singtel Future Markers programme, and another undisclosed amount under the Singapore government’s National Youth Fund. While these successes have been satisfying, the journey to ensuring Project We Forgot’s long-term future is still not an easy one, said Melissa, who has used her own savings to set up the business. After more than two years working on the social enterprise, Melissa said she has learnt so much more about caregiving for patients with dementia — more than she did while her father was still alive. Photo: Project We Forgot founder Melissa Chan founded the social enterprise in 2015, after the death of her father, who had dementia.